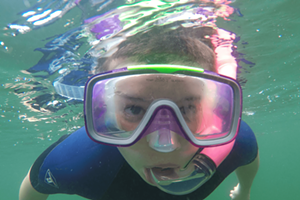 A Standout Season: Vermonters Share Memorable Winter Stories | Features | Kids VT - small people, big ideas! Vermont's daylight hours dwindle in December and remain scarce deep into January. But this season of darkness also carries a magical mystique. In early winter, even grownups — who will tire of digging out driveways and braving snowy roads by March and April — are entranced by the transformation of our landscape into a winter wonderland. In the season that carries so many memories — of holidays, family and the enchantment of childhood — we asked a handful of accomplished Vermonters to share favorite winter memories. Although I tend to think of winter as something to endure versus enjoy, the truth is some of my best memories of raising kids in Vermont revolve around winter — sleigh rides at Shelburne Farms, sledding at the Old Round Church in Richmond, the River of Light lantern parade in Waterbury, watching candy canes being made in Stowe, walking out on a frozen Lake Champlain, snow days (if I also miraculously don't have to work), and, in general, having a valid excuse for a daily hot chocolate. But one of my best winter memories is of something I wasn't even here for. I was in L.A. for almost three weeks for a freelance job. And while it took a small village to get through it (friends to take my kids after school, my husband's employer being flexible about his shorter hours), the real weight fell to my husband. 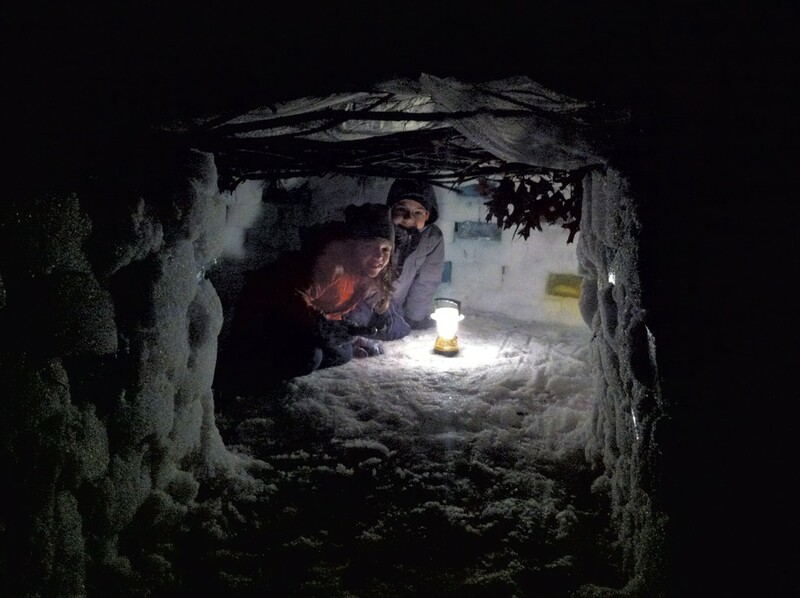 So he did the obvious thing — built an igloo with "stained glass" windows in our backyard. (Side note: This is definitely not what I would have done in his place.) He worked with the kids to fill empty milk cartons with water and food coloring, then stuck them outside to freeze, although wildly fluctuating temperatures constantly threatened keeping the structure to code. I still can't quite believe I never saw it in person — the full loop of snow bricks and colored ice windows topped with a pine branch roof — as it had mostly melted by the time I returned. But that one project reminded me why we moved here. It showed that, while the places we live and some of the things that happen in our lives aren't always easy, that doesn't mean they don't offer the opportunity to be surprising or beautiful. When one of the children in your family is a few years younger than the other, the younger one might feel like they're always playing catch-up. Rex was 5 last winter, and his brother, Zane, was 10. My wife, Sarah, and I took them skiing together nearly every weekend. The first time Zane got on a ski lift without me having to hoist him up was surprisingly emotional. When Rex did the same, it was doubly so, because I realized there would soon be a time they would both be doing this without me. But not quite yet: Rex had a hard time keeping up with the family, and he got cold easily. He was on a tiny pair of skis, and when he fell, it was always a yard sale — skis and poles everywhere — and we were grateful that little boys are so elastic. He literally broke one of his hand-me-down ski boots in two one afternoon. A roll of duct tape at the summit house saved the day. Rex loved being out with us, but I worried that he felt ... too small. He seemed to get discouraged sometimes. We never stopped taking Rex with us because the family joy of watching him learn how to move his little body over snow was better than any of the time we could spend skiing without him. By midwinter, it all started coming together: he started skiing parallel, and he was able to do a few jumps. We put him on longer skis. He hardly fell, and he didn't complain about the cold as much. There was one Sunday last February I'll never forget: Rex skied his first black-diamond run, and teased his mother about keeping up. 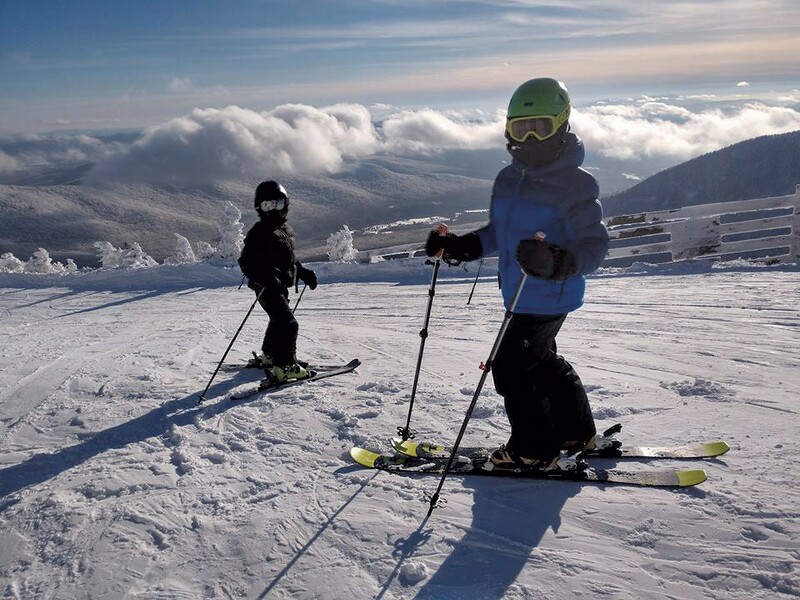 He skied alongside his brother, and followed him through the terrain park without missing a beat. You could tell that he felt so happy that we could all ski together as a family, and that he didn't feel so little anymore. When we got down to the lodge at the end of that day, the sun was still out, and he was warm and smiling from ear to ear. "Dad," he said, "I wish every day could be like today." "Me, too," I said to him. "Me, too." Among the photos I keep on my phone is one of my mother introducing me to a doll that's about an inch or two taller than I am. It's Christmas morning, and I'm 3 years old. The doll is called Peter Playpal and it is — literally and metaphorically — that year's big present from Santa Claus. My mother has honey blond hair (perfectly coiffed), a pressed skirt, and impeccably straight legs. 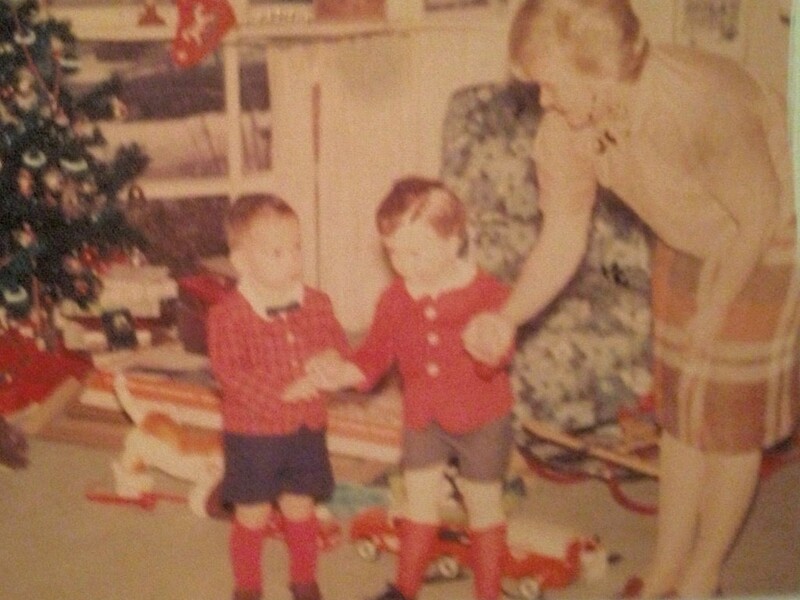 She has dressed me to look like the doll: a red blazer, short pants and red socks. In the photo, I seem bewildered. According to family lore, Santa brought me the Peter Playpal doll because I used to talk to the mannequins at a department store when my mother was clothes shopping. (Given the amount of time my mother spent clothes shopping, the fact that I talked to mannequins should have surprised no one.) But I was always reassured that the doll was never meant to replace me, even though it could wear my clothes — and did. I have no memories of playing with the doll, but I have very fond memories of the way the doll always appeared in my mother's Christmas tableaus. Christmas wasn't Christmas without Peter — and, at some point, Patti. Yup, my mother bought the doll a sister: Patti Playpal. I've found TV ads for Patti on YouTube, and based on the commercial, she's zombie scary. But back in the 1960s and early 1970s, she and Peter were simply part of a quaint Bohjalian holiday tradition: life-size dolls to celebrate Christmas, ring in the New Year, and (apparently) frighten the houseguests. The woods behind our house have trails that are used by lots of people. This means even when there's deep snow everywhere else, the snow along the trails is so packed down that you can just use sneakers. It also means that some of the hills turn into luge tracks. In the late afternoon, when the sun was starting to set, we'd hike in, towing our beat-up plastic sled behind us. Then we'd climb to the top of that luge track, squish onto the sled together, and let go — and those woods would no longer be silent. Yelling Woooooohoooooo at the top of your lungs has all sorts of health benefits. And you might assume all this backcountry sledding happened when I was a kid, but I was 29 years old and not quite yet a parent when I first went. It's never too late to start new traditions. 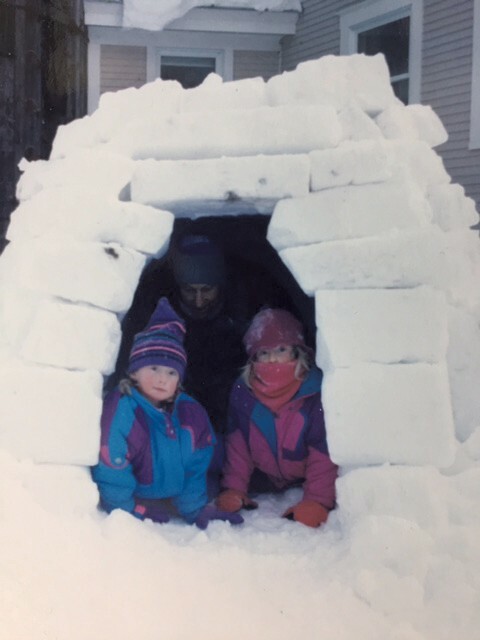 One of my fondest winter memories with the kids was digging snow caves in the driveway pile. Once the plowing was done, and it was safe to play, we would get to work. We'd make a plan for where to build the tunnel, whether it would have two entrances or just one — occasionally three if it was a really good pile! — and various other design details. Sometimes, if the snow was good enough for cutting blocks, we would make it an "igloo." Then we'd get to work with our shovels. 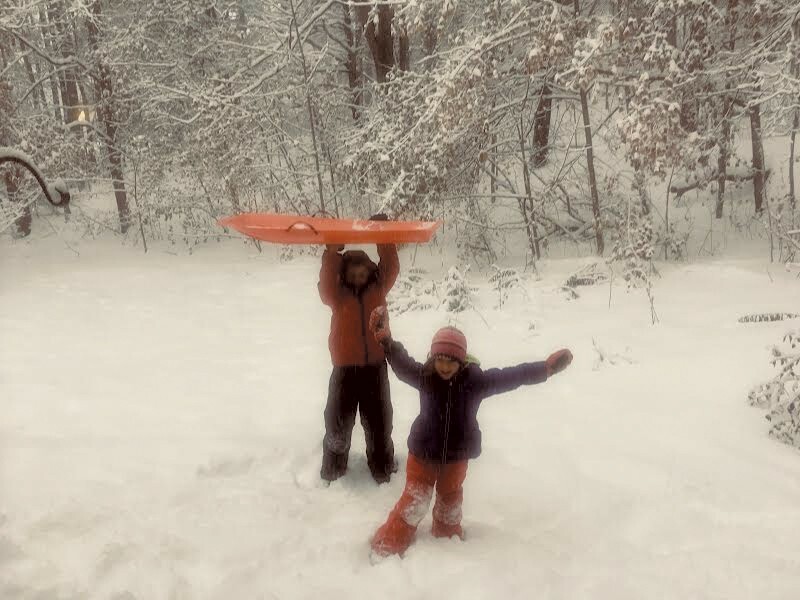 Ideally, and most often, it was a snow day, and I was lucky enough to be able to do some work from home when I needed to, so I could be fully involved. As I recall, we didn't end up spending much time in the caves afterwards — it was more about the process of building them!